*Baking: Mouth watering lemon blue berry cake + other baking tips. *Frosting: Amazing techniques using frosting. *Fondant & Royal Icing Works: Simple and elegant dots with fondant & royal icing. *Cake Sculpting: Simple and easy sculpting of elegant teapot. *Exotic Sugar Flower: Exotic sugar flower (Rose) made easy. *Free Hand Moulding: Making ‘too cute’ figurines and giving them your own personality using cold porcelain. 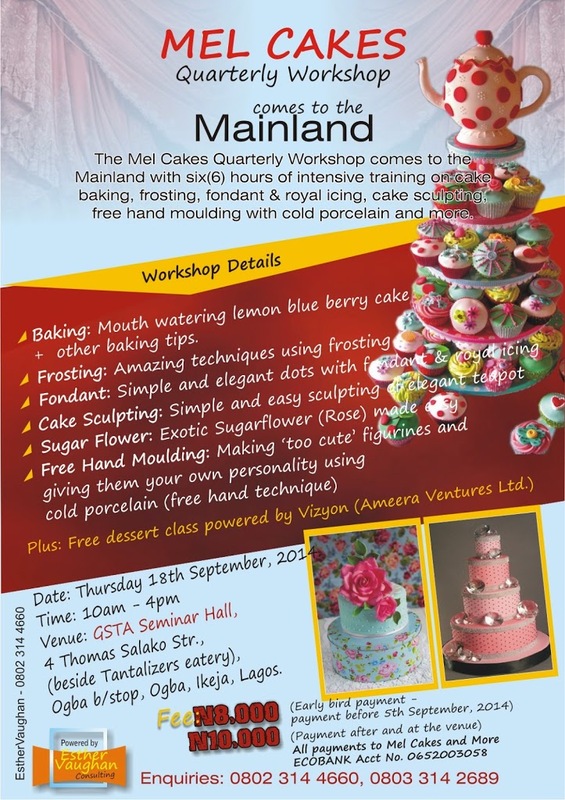 Venue: GSTA Seminar Hall, No 4 Thomas Salako street(beside Tantalizers Eatery), Ogba b/stop,Ogba,Lagos. Don’t Miss It, BE THERE!